Made by a Japanese person using the name air_variable. He’s using an XBee for wireless serial communication. This just gives you a serial line, which can be interfaced over USB. This is not real MIDI, but you can use a serial to MIDI converter for this. For example, BlipBox MIDI serial or Spikenzie Labs Serial MIDI. Or why not Korg’s (!) PCIF-NT driver, as suggested in Lady Ada’s MIDI Zigbee tutorial. There are even more serial MIDI converters if you use Google. 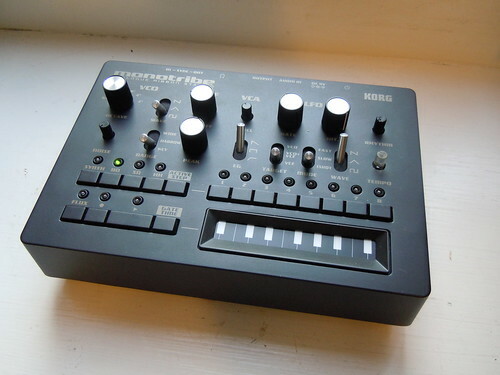 Voilà Korg monotribe, the successor to its little brother, the monotron. The Monotron is a cheap, squeeky, and easily moddable toy synth with an MS-10/20-like filter topology. It has a ribbon keyboard an audio oscillator, an LFO, a lowpass filter, and not much more. The monotron was an instant hit, and Korg released schematics for it to aid modders further. When I heard about the monotribe, I had my doubts. Mostly that there’s only one pattern, which is 8 steps long. Well, there are 8 extra steps for the drums, as well as a “flux mode” which records your movements on the ribbon continuously. In that sense, it is limited, and is an instrument made to be played with your hands, rather than be programmed. But as it turned out, this was a design choice, and not a technical limitation. I can easily imagine why. They wanted it to seem as analog and playful as possible. Same thing with MIDI. Officially, the monotribe doesn’t support MIDI. It does however offer a sync pulse output and input. This allows it to be synced to other monotribes, modular synthesizers or even Korg’s own virtual iMS-20/iElectribe, using a special sync app on a second iPhone/Pod/Pad. However, the lack of MIDI is still a slight limitation. This page was previously hosted on http://gameboygenius.8bitcollective.com/wordpress/category/monotribe/ (*).